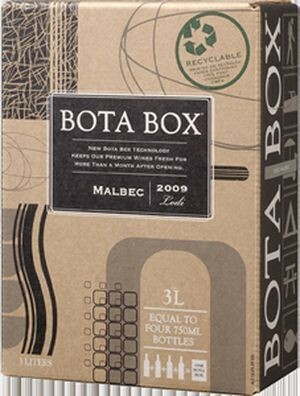 Bota Box holds the equivalent of four bottles of wine and has revolutionized the way consumers now drink wine. Its name is derived from the bota bag that was popular in the 1960s, especially with outdoor enthusiasts because of its portability and convenience. This California Malbec is a plush, medium bodied wine with aromas of ripe plum and blackberry with a touch of roasted coffee; jammy, luscious flavors of plums and blueberry pie follow, leading into chewy tannins on the finish. Malbec's bold profile make it the perfect pairing to red meats as well as spicy Mexican, Cajun, Indian and tomato-based Italian dishes.